"Build An Amazing Japanese Koi Fish Garden Pond!" 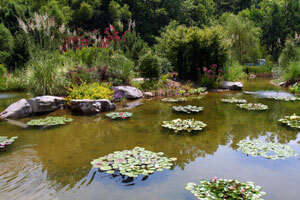 Designing And Building Your Pond Can Be Fun And Easy!" Koi Fish Ponds are very popular with more and more people adding a Koi fish pond to their backyard every day! The brightly colored Japanese fish are a delight to watch and feed, and having a beautiful Koi pond in your backyard is a feature to admire. Building a Koi fish pond does require different materials than a regular backyard pond, so it's essential to get it right the first time. In this ebook you will find everything you need to get started. You could spend hundreds of hours online searching for the information yourself, like I did, or you can benefit from my research! 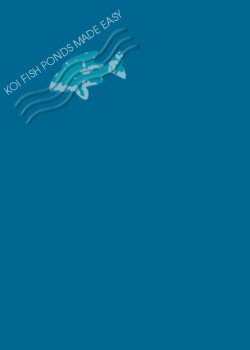 Also, you will get a free bonus ebook that will teach you how to care for your Koi Fish and keep them healthy. 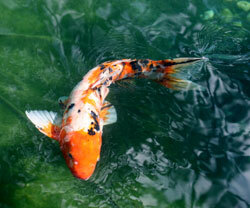 How, what, and when to feed your Koi fish... and much much more! PLUS You'll receive a free bonus ebook - $19.00 value - This guide will show you lots more about caring for your Koi and your plants, and ensure a happy healthy pond. Take advantage of my hundreds of hours of research and save yourself a fortune in the long run! "How To Care For Your Koi Fish"
How to train your Koi fish to feed from your hand and much much more! quickly enjoy your Koi pond. Buy this Guide, print it out, get out your highlighter, and be ready to scribble notes on these pages! ... You'll be referring to this Guide over and over again. With all the great resourses, how-to instructions, and tips included in "Koi Fish Ponds Made Easy" and "How To Care For Your Koi Fish", you really can't go wrong. You can easily build your own Koi Fish Pond in no time! This Guide has helped lots of people. Try it with no risk! ... Request an easy automatic instant refund if you are not 100% satisfied -- and you can still keep the Guide. We trust your honesty. "Wow Michele! I was just floored with the amount of useful information, helpful hints, and wonderful illustrations in your ebooks on Koi Ponds and Koi Fish. These are, hands-down, the best information sources I have found on the subject! Anyone who has ANY interest in Koi Fish or Koi Ponds will find these guides essential and I will be happy to recommend them to anyone who has an interest in this subject. You did a fantastic job on these great guides!" There are no shipping costs or taxes on this item. Your credit card information is safely encrypted by ClickBank and then destroyed after the transaction. None of your personal information will ever be shared or used for any purpose. The 60 day money back guarantee is enforced by ClickBank. P.S. Just to reassure you about our refund policy, click here to read Clickbank's refund policy. We use Clickbank to sell our products to ensure 100% safety, and to provide you the assurance needed when making purchases online. P.P.S: To be 100% honest, I've never had one single refund. So you see, there is no reason to not take advantage of this offer NOW!!! Purchase Comes With Complete And Easy Instructions For Fast And Easy Download and Guaranteed Email Support. I bought your ebook yesterday and read it from cover to cover. I am even more excited now about building my koi pond than ever. The detailed information gave me a thorough list of what I will need, plus the best way to build it. Thanks again. You can easily unsubscribe at anytime! Copyright Simplistic Solutions, 2013. All Rights Reserved.